You’re busy; we get it! 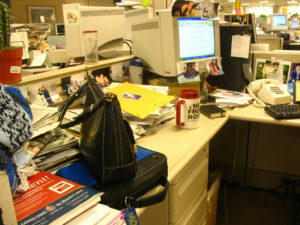 General cleaning and tidiness may be low on your list of priorities while at work. But here’s the thing! Having a clean and tidy office can benefit you in a variety of ways. In this article, we will consider a few of the reasons why. If you’re forever looking for a lost pen or an important work document because of the messiness of your work area, then you are going to waste valuable time. It’s time to bring order to the chaos, using our office cleaning tips to help you clean up the space you are working in. By storing things away neatly, and with the fine art of labelling, you will get your productivity back up to speed in no time. An untidy and unclean office can be a health and safety nightmare. Loose wires can cause electrical damage. Cables strewn across the floor can lead to trips and falls. Spills that haven’t been mopped up can also lead to a fall. Not only are you putting yourself at risk of injury, but you are doing the same for co-workers and customers. Legal action and compensation expenses will surely follow. Aside from having a nasty accident, you may also be prone to illnesses and infections if hygiene has been placed low on the agenda. If people aren’t washing their hands after being in the bathroom, germs will be spread. If loose food has been left out in the kitchen area, there is a chance of contamination and food poisoning. In both cases, correct signage needs to be put up with hygiene reminders before everybody is placed in quarantine! You should also consider cleaning professionals, looking at commercial cleaning services rates to find somebody with the skills to thoroughly clean the workplace before the number of sick days rocket! Let’s face it. Would you want an important business client coming to your workspace when it’s in a mess? Not only are you putting their health at risk, but you are also giving a terrible first impression when trying to win their favour. It doesn’t take a lot to have a general tidy up, and provided you maintain cleanliness around your workspace, you won’t be embarrassed when a client turns up unannounced. A tidy desk is a tidy mind! By removing the clutter, and eliminating any mess around the rest of your office, you will be in a better state mentally to get on with the jobs you have to do at work. Because, as we all know, that annoying cable in the corner of your eye, and that rotting smell from an unemptied bin, are guaranteed ways to distract your once-focused mind! So, how clean is your office space? You are doing yourself a favor by getting on top of any mess if it isn’t up to scratch, as you will benefit in all the ways we have mentioned in this article. Thanks for reading, and happy cleaning! There are so many benefits of a clean office, all the above, and many more. Some of the offices I clean leave a lot to be desired, especially end of tenancy. It makes you wonder why clients ever did business with people as first impressions really do count. Awesome post! This makes it so important to clean the work area. Thanks for sharing the knowledge. Thanks for mentioning how a clean office will help you keep your productivity numbers up by having your important documents exactly where you need them. If I were to win a company, then I will surely invest in a high-quality janitorial service that can keep our offices clean and organized so that we are working as efficiently as possible. That will surely decrease downtimes caused by misplaced work documents. Great article! Actually, we need a clean and well-maintained office so that we can work in a lively, energetic, and stress-free environment.